Are you always rushing home after work to cook dinner and questions always pop up in your mind? Don't know what to cook for dinner tonight? Looking for a quick and easy recipe? These are the questions that float in my mom's mind because she is one of those that need to rush home to cook dinner for the family (my dad, brother, and granny). No doubt, Philips Pressure Cooker has helped her a lot in preparing meals that usually takes hours now only require minutes to dish up yummy dinner feast. 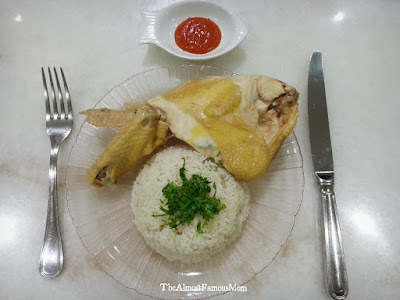 Yesterday I went to my parents' home and together we cooked this wonderful, quick and easy Hainanese Chicken Rice for dinner. 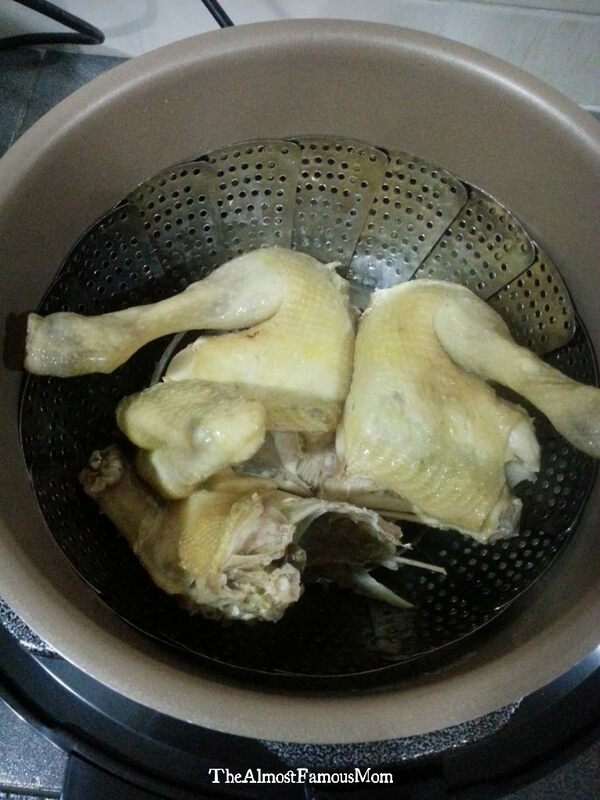 In less than 30 minutes, we have an aromatic pot of "oily rice" and tender "white chicken" (白鸡). Thank you to Wawa Wawa for such inspiring recipe! 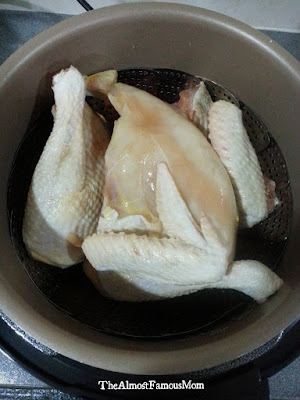 Clean the chicken thoroughly and marinate it with soy sauce, sesame oil, Chinese cooking wine, oyster sauce, salt and pepper. Cover the bowl with cling film and refrigerate for at least 1 hour or more. 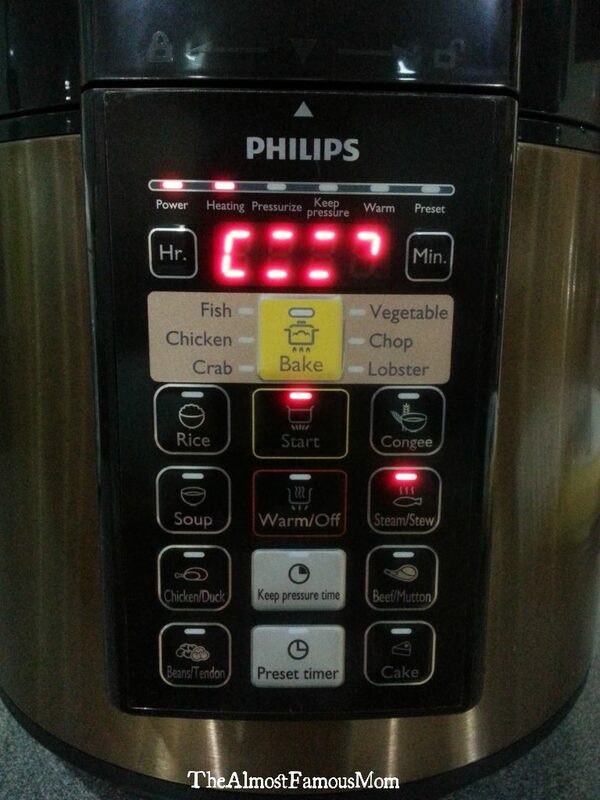 Turn on Philips Pressure Cooker and set to Bake Vegetable mode. 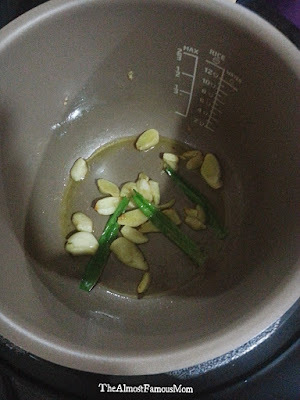 Add butter, pandan leaves, ginger and garlic slices. Stir-fry until fragrant. Pour the washed rice and add in the water accordingly. Insert the steamer rack or basket into the pot. Place the chicken pieces on the steamer basket (if cooking with whole chicken then I would recommend you to use a steamer rack). Turn off Bake mode and close the lid. Turn the valve to Seal and select Steam/Stew mode then press start. Once the cooking cycle is done, be sure to check the Floater is at "relaxed position" before opening the lid. 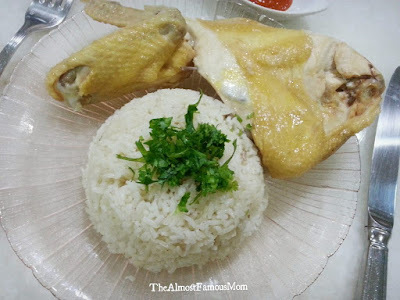 We never get tired of this Quick & Easy Hainanese Chicken Rice. 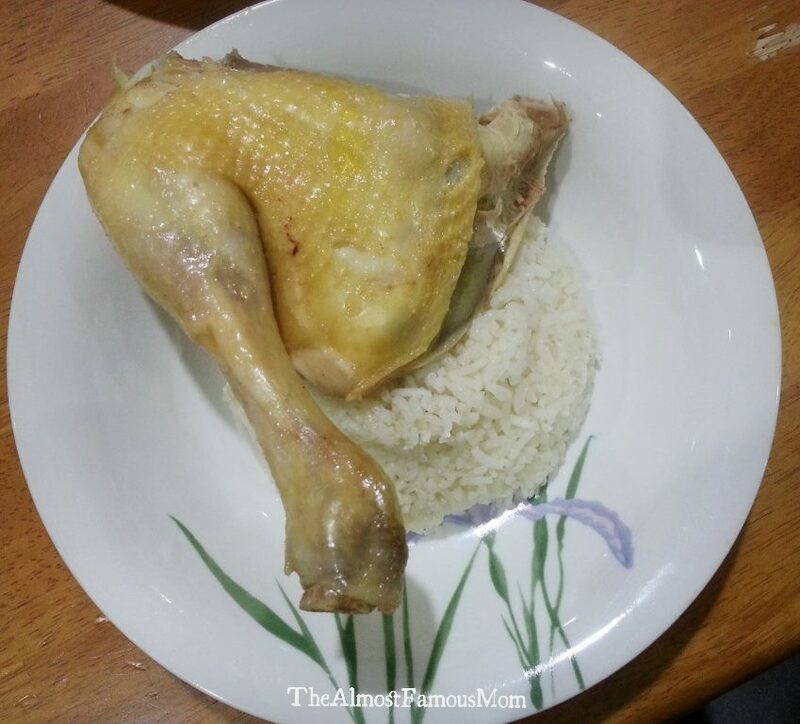 Wow, looks your rice part that stimulate taste. Thanks for sharing. i would love to try it for my family's dinner . Hi Samantha, a noob here. Is the steamer basket available from Philips? So for rice, instead of selecting"Rice", we can also use steam/stew button? hi again! 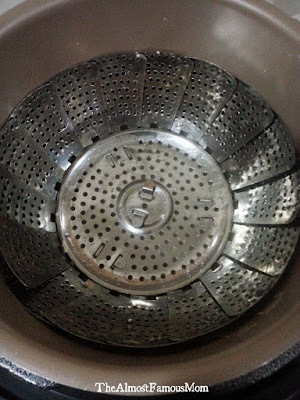 the steamer basket you see here is bought from pasar pagi (not from Philips). Yes, because it has the same function after all but we need to be smart in the timing so the rice will not be overcooked. 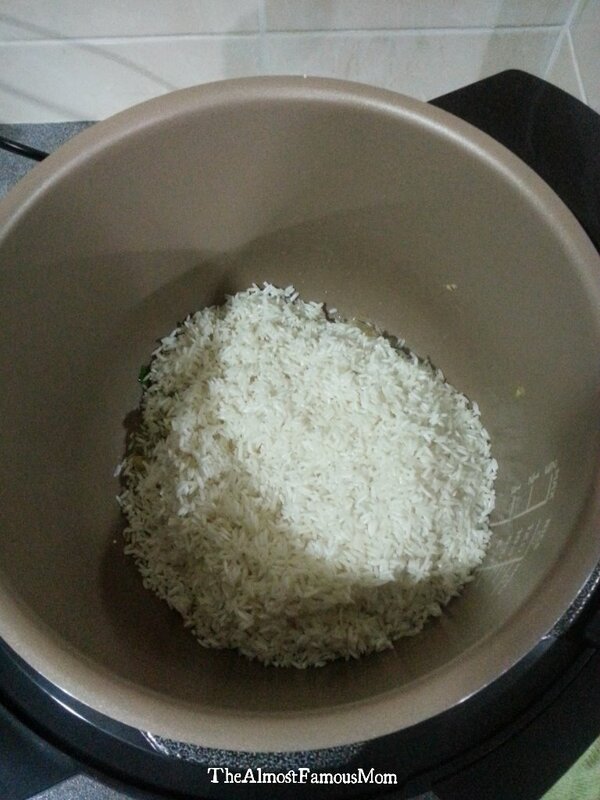 Hi, can I scale down the amount of rice to 2 cups? Water will also be 2 cups? And I keep to the same Stew setting? Thanks! Sure can! It is a 1:1 ratio (depending on the rice texture overall). And yes, you will be using the Stew mode too. Happy Cooking! 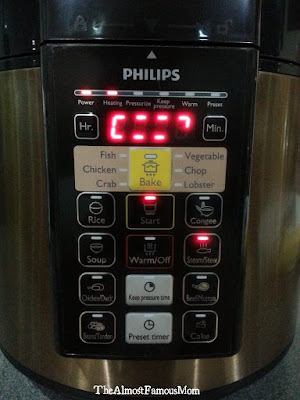 hi, If using Philips Pressure Cooker it is already preset timer so you just need to use Steam/Stew mode (no need to adjust the Keeping Pressure Time). Hi thanks for the recipe, just tried making it but the color of the chicken skin did not turn yellow. Wondering did you use free range chicken to achieve the color ? Also, do you pour the remaining of the marinate from the chicken into the pressure cooking as well? Anyway the taste was really good :) thanks for sharing. Hi there! Yes, I used free range chicken (a.k.a. kampung chicken). You can definitely pour the marinate sauce by reducing the water use for the rice. 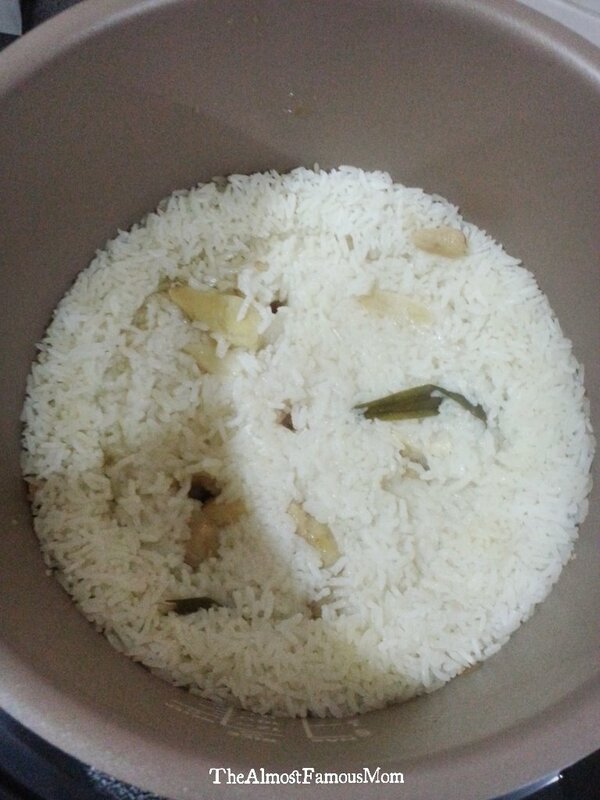 The rice will turn out more flavourful!